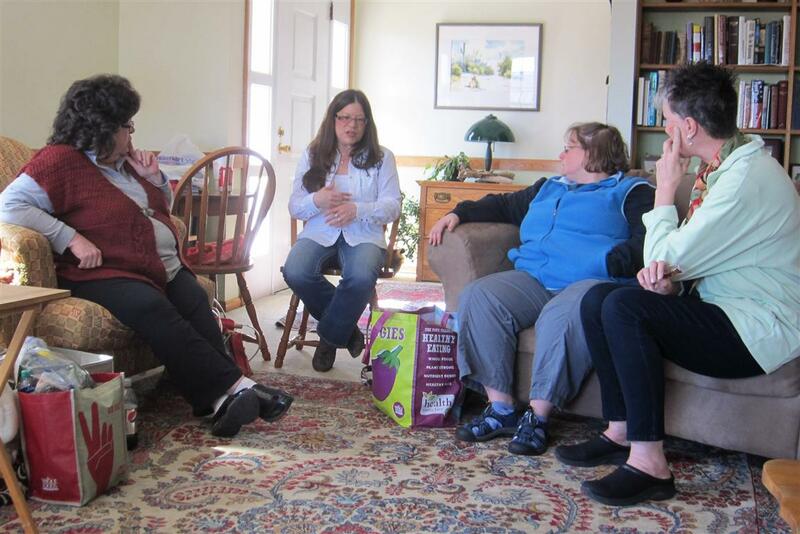 One of the Fiber Guild 2012 goals is to share “Where We Create,” with a visit the workshops/farms of each member. We began this circuit of member homes at my home, located on a hill overlooking Gallipolis and the Ohio River. Mr. Toad’s car from the French Art Colony’s children’s theater production of “Mr. Toad’s Mad Adventures.” April 2012. I am primarily an art quilter, but also make traditional baby quilts, as well as oil/acrylic painting and puppet theater props. 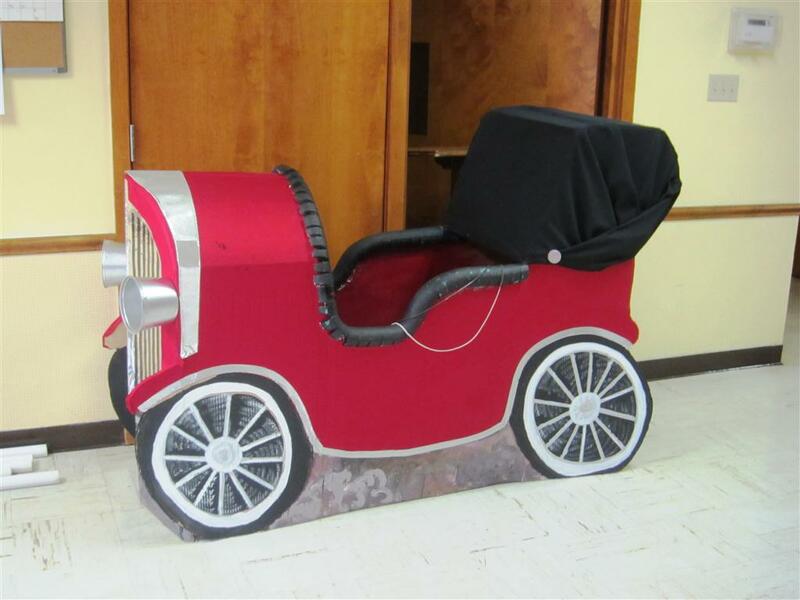 Recently, I created the scenery and some of the larger props for church and children’s theater productions. First quilting area in TV room-only 6′ x 9′. 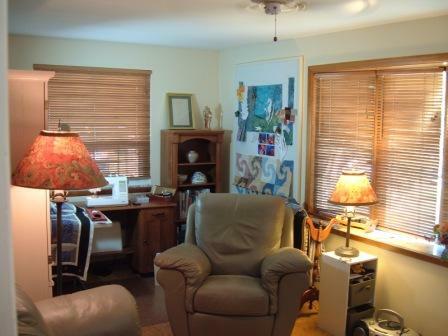 Several years ago, my quilting activities covered 3 rooms, with separate areas for sewing/quilting, cutting and ironing. The sewing area at the end of the TV room was only 6′ by 9′, with very little space for storage of fabrics and supplies. A year ago, Chuck and I converted a bedroom/storage area into a dedicated quilting studio that also serves as a painting studio and prop workshop. This area has a mid-arm quilting machine, large work table for cutting fabric, a 6′ x 8′ design wall and multiple storage units. 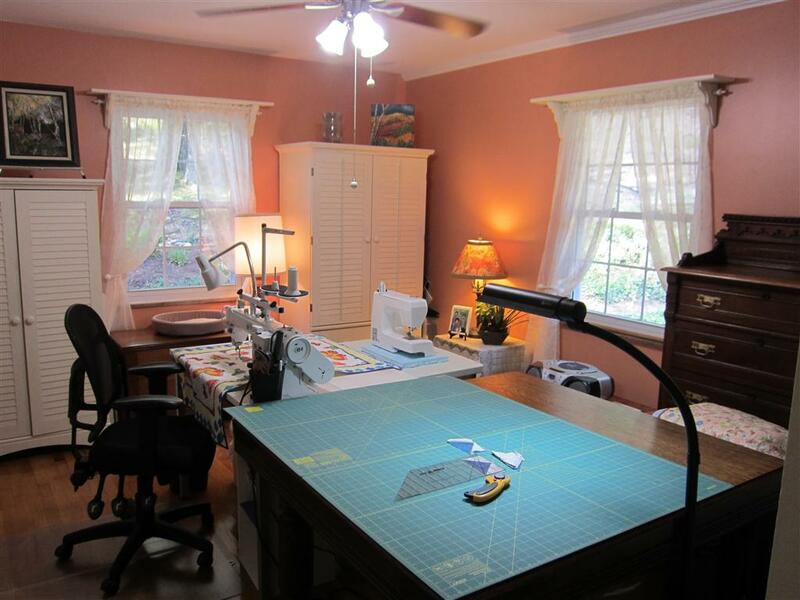 9′ x 12′ studio provides cutting, quilting and sewing stations, with plenty of storage. Although I sometimes piece in the earlier quilting area, I usually set up a small table in the new studio for my portable sewing machine. The work table, a repurposed dining room table, is on casters and can expand from 4′ square to 4′ x 6′ to allow batting to be sandwiched between backing and the completed quilt top. 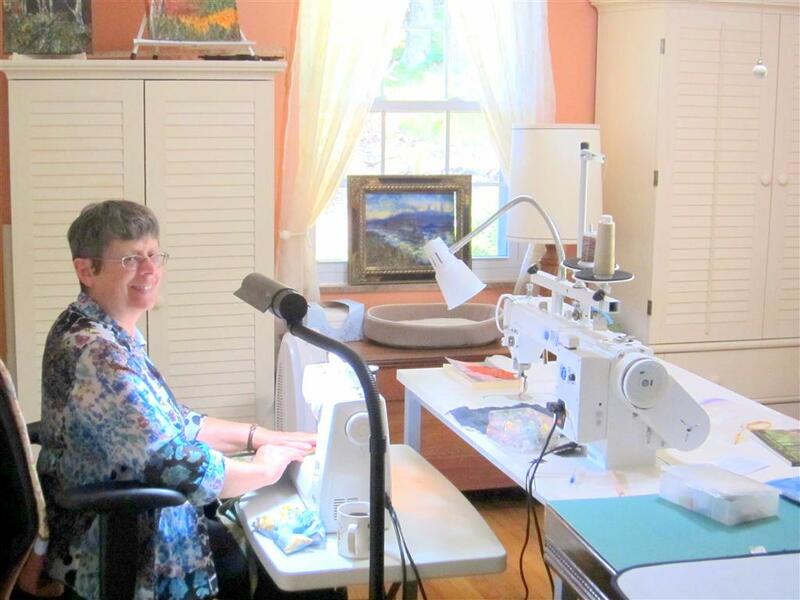 The mid arm quilting machine, a Tin Lizzie 18, is a sit-down model, where the quilter moves the quilt by hand, rather than moving the machine over the quilt mounted onto a 10′ floor frame. This setup is more practical for me. It takes up much less room and allows me to work on several projects at once. It is easy to quickly move one quilt aside to work on another. The room has excellent lighting–cool white bulbs in the overhead light as well as in the goose-neck floor lamp. Morning sun coming through the windows gives a warm glow to the room. Storage units include two Sauder cabinets, two antique chests and an Eastlake highboy dresser. 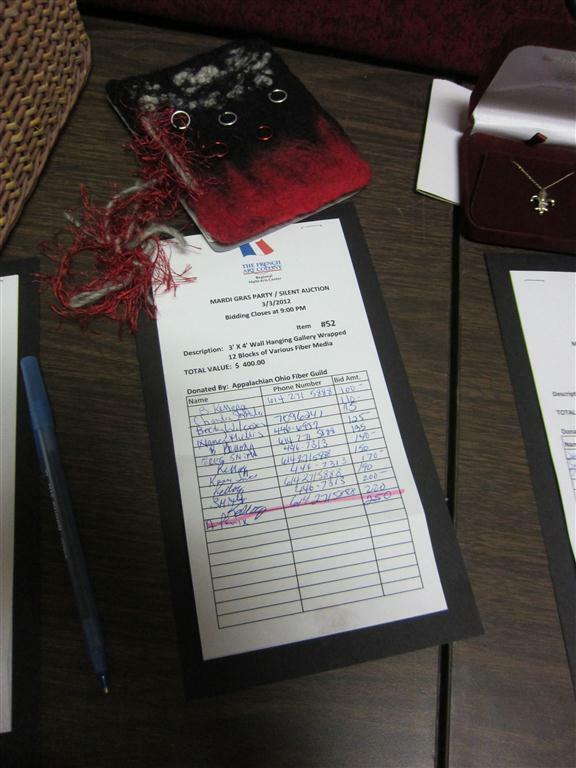 Marlene and I reported on attending the French Art Colony’s Silent Auction Fundraiser, held at the Gallipolis Moose Club April 7. We went to see the fate of the 2′ x 4′ wall hanging donated to the FAC by Guild members. The process of making the wall hanging can be found on the Fiber Guild blog here. Look for Part 2 and 3 to complete the creative process and and later installation at BTS in Gallipolis. OH. 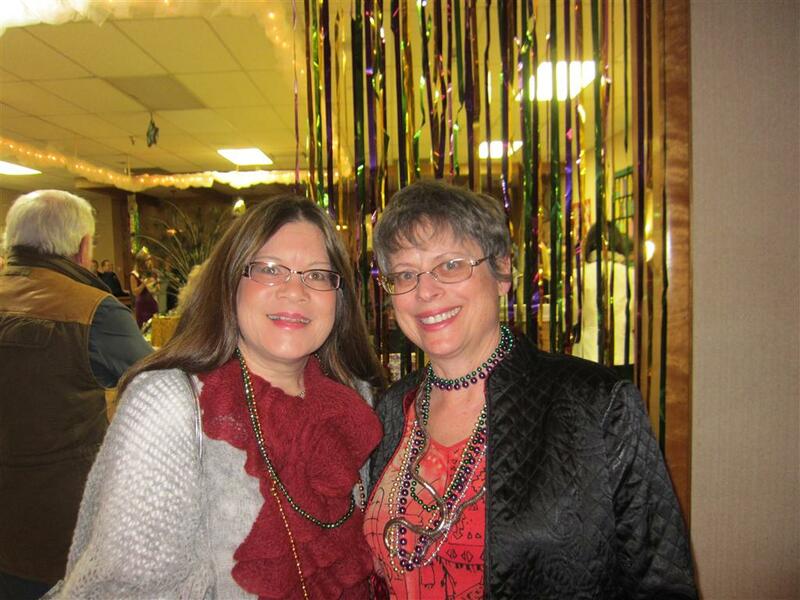 The Moose Club was decorated for Mardi Gras, with lots of tinsel, bead necklaces, masks. 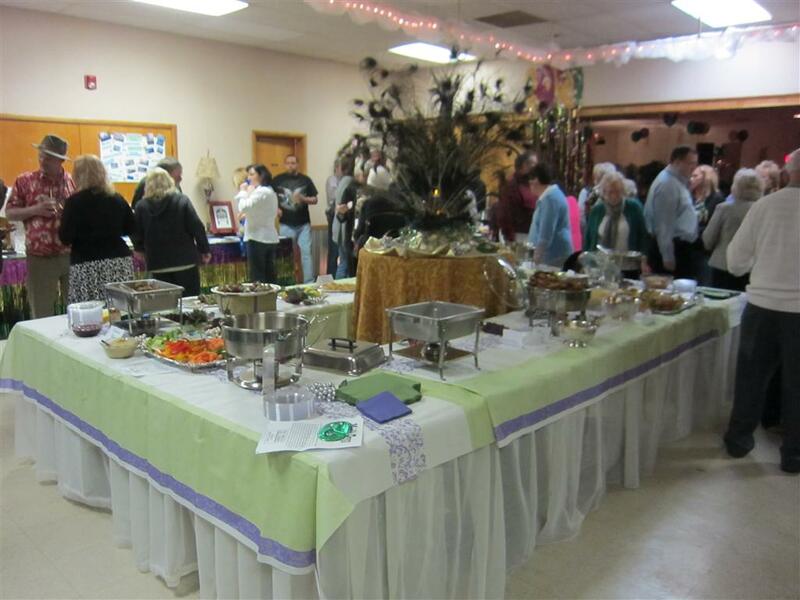 The buffet table featured New Orleans style foods—Yumm! 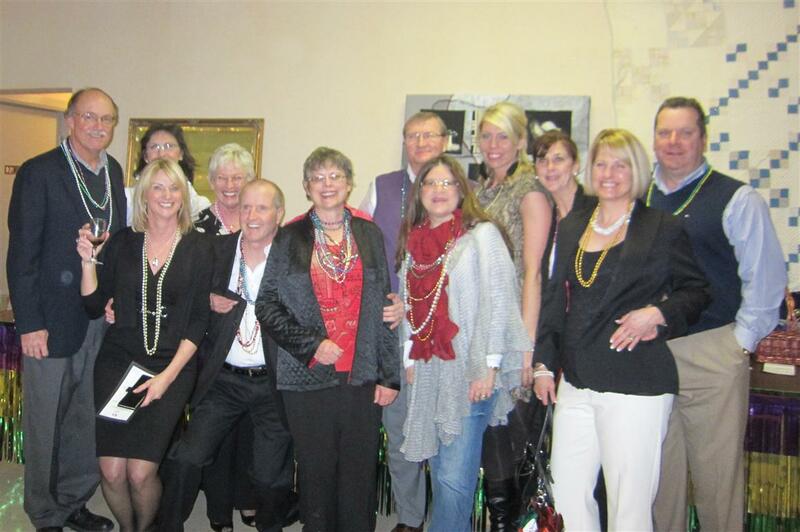 All those attending were given a mask and beads to look the part of revelers. Bidding for the hundreds of donated items was fierce, in some cases. During the evening, guests wandered around the perimeter of the buffet room, looking at the goods on the tables and walls and writing their bids on those they wanted to take home. As the evening wound down, the attendees were notified of the countdown to the closing bid: 10….. 5….4…..3…..2…..1 Bidding closed! Entry filed under: Fiber Guild, Quilt Studio, Uncategorized, Wall Hangings. Tags: FAC, French Art Colony, Prop Car, Quilting Studio, Silent Auction, Wall Hanging, Work Spaces. Deer Out My Window	Christmas Daisy? I am interested in your thoughts and experiences with your Tin Lizzie. I am considering purchasing one and am researching the machine and the feedback of current owners. Thanks in advance for any info you may have to offer. Hi, June! Sorry about the late reply!I see from your blog that you purchased a Babylock sit down quilting machine. I am sure you are enjoying it very much! They have great service! I am not sure how the Babylock compares with the Tin Lizzie, but I am very pleased with mine. I especially like how easy it is to go from one unfinished project to another–an issue for those considering a sit-down vs more traditional longarm setup. I had a little problem with a faulty controler board, which was replaced. Now it works very well.